The wonderful magical microsociety of Dragon*Con, contained entirely within the mazelike confines of three connected hotels and one satellite a few blocks away, is something I think everyone should experience once. Do it, if only to get in touch with your inner geek and your secret furry. Everyone has one lurking inside, I like to think. There has to be a part of you that yearns to don a cape and prance around as if you were faster than a speeding bullet and able to leap freight trains in a single bound. If you don’t, you’re probably not much fun to be around anyway. 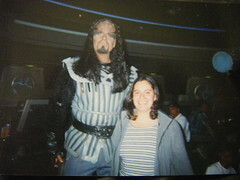 I remember being an outsider who had never been to a Con save for a couple Star Trek conventions when I was a preteen. It was all for research I was doing for a class, mind you. 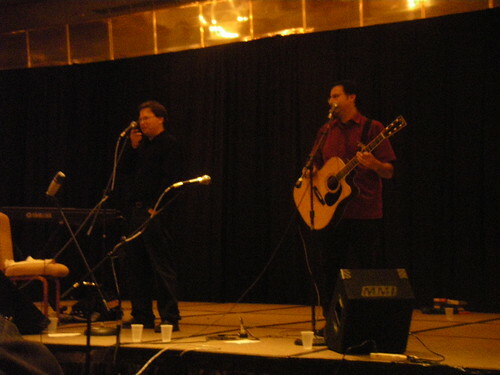 I remember stuffing myself into the circa-1970s orange bleachers inside the Phoenix Veterans Memorial Coliseum so I could listen to Garrett Wang from Star Trek: Voyager, and John DeLancey, who played Q in Star Trek: The Next Generation. I found both actors’ schpiels to be engaging and expected such from all cons afterward. I also had high expectations from having seen “Star Trek: The Experience” at the Las Vegas Hilton hotel, long before the forces of economy and practicality took away one of these old holdovers from Sin City’s drunken flirtations with family-friendliness, whimsy and imagination. Having long ago left my preteen years in another galaxy, seeing these geeks (an affectionate term) standing on the train platform took me back to those geeky days of my youth when I used to thumb through an encyclopedia of information about “Star Trek: The Next Generation.” There was a time when I could describe the plot of every episode in great detail and tell you all about the various quirks and life stories of each character. I don’t know what happened to that part of me, but I don’t have it anymore and I kind of want it back. Looking at these current-day con lovers made me wish I was one of them. Not to mention that marveling at powerful superheroes’ ordinary means of transit made me laugh. Hard. Another thing that’s important to consider is that Labor Day weekend is a busy one in Atlanta, and it’s a time when you might find yourself with a decked-out football fanatic on one side and a storm trooper on the other. One year I passed the time on my 45-minute trip intown by making interesting conversation with a chatty pirate’s wench. She had a lot to say about piracy and about life in general. I wished I’d had the gumption to capture that moment on film. At some point, I’d seen enough of this fantastic tomfoolery and decided I had to be part of it. I decided to give it a shot. The journey began by standing in line for about an hour to buy tickets onsite. Lucky me, I could by a second year’s membership to Dragon*Con for just $10 more (or some ridiculous sum like that). So I did, and by that point, I was locked in for two years of this wonderful nonsense. 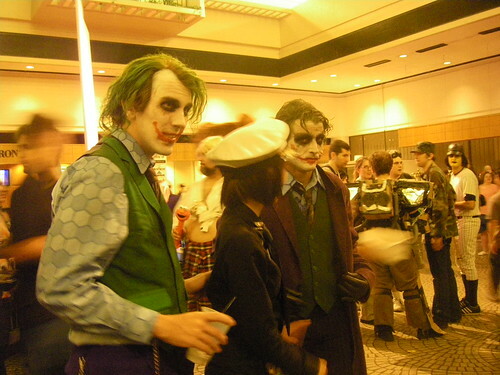 My first year at Dragon*Con, I approached the scene with a lot of trepidation. I went by myself into the wild and wooly crowd, armed with a camera and the excuse that I was just a journalist passing through. I told myself, “This year I’m just documenting a scene.” I opted to remain a detached observer of the absurdity around me. My second year was the best. I had a plan. I even brought an iReport kit with me and interviewed people. With the help of coworkers and friends, I saw quite a bit of things and had lots of fun. Not to mention, I took way too many pictures. Afterward, I made my television debut talking about the event with a viking hat on. My third year’s expedition to Dragon*Con was predated by an exhausting run through San Diego Comic-Con, which is a totally different animal and yet much the same. The focus is on comics primarily and it’s about twice as big, but not necessarily as cool or fun. I think at some point I just got a little tired. I realized that the Con experience has its limits. I look forward to it, and at the same time, I know that I will be fatigued and frustrated by it. I’ll want to kick myself, but I’ll go to another con, and I’ll enjoy it. That’s the way it goes. After all the lines and crowds and odoriffic science fiction costumes around you, the memories are what remain. It’s a unique thing, something you can’t really get anywhere else, and a surreal exploration of that part of us that still likes to dress up and pretend to be someone else. I hope that we can all dig deep and find it within ourselves, even if we wouldn’t be caught dead in Spandex. Sunday, I do have a ticket. It’s a short day, so we have to make it count. Subject to change at any time, below are the programs that I’m eyeing to attend. Of course it won’t be possible to attend them all, but I think I’ll get a well-rounded day. 10:00 a.m.: Tie between Comic-Con film school (postproduction) and the Dr. Who panel. Also Phineas & Ferb. 11:00 a.m.: Lots of great stuff including Women of Marvel, American Dad and Emily the Strange. Also some cartoon voices. 11:30 a.m.: Newspaper editorial cartoonists. I’d love to go to this, but don’t think I”ll make it. Noon: Random stuff. Good time for lunch. 1:00: Ghost Whisperer stars panel will have a few big-shots. Expecting hard time getting in. So yeah, we’re going to be en route to San Diego, CA, for the Comic-Con extravaganza this weekend. I could only get tickets for Sunday but that’s better than nothing. I didn’t realize how much of a Kind of a Big Deal this was. 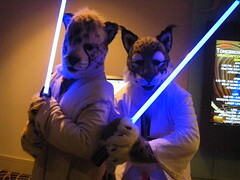 I admittedly enjoy hanging out at Atlanta’s own Dragon*Con (mostly for the surrounding spectacle and saber-toothed tigers such as shown here) so I assume this will be right up my alley. After that we’ll head for San Francisco and do some exploring around there. I have a few things on my list to do while in the Bay, and would appreciate any ideas from the wide world out there. My bank account is emitting a few hunger pains so I am trying to keep the expenditures down as much as possible; and yet I think — to some degree — you have to take a few liberties from time to time. Speaking of obsessive traveling, I’ll also be heading to Paris, France, yes that Paris, in September, and I think this might be the biggest travel year EVER. Last year was pretty epic, but I think this might top it. I’m just learning about Paul and Storm… good stuff. I mean, it takes a lot of brainz to realize that there are a lot of “seamen” on pirate ships. Good show. Bacteria/disease dolls were given out (so you can “catch” syphillis) and even audio books on tape. So they called Jonathan Coulton during the performance… based on Twitter exchanges I saw, the comedic routine may have backfired. Paul called and made a lot of jokes teasing Coulton for being at PAX (holding the phone to the Mic) and then hung up the phone mid-convo. Dana Snyder, Master Shake’s voice, was a guest. Paul and Storm – on the phone…, originally uploaded by N-Sai.